On Saturday, the weather was perfect for a hike. The Montezuma National Wildlife Refuge is not far from our home and seemed like the perfect place to go. Dinomite was super excited and even packed his bird, reptile, and amphibian guides to take along. We decided to take their shortest trail, for Sunshine's sake. The kiddos did great along the trails. However, I think Bulldozer scared off any creatures we would have seen as he had to hit every plant he saw with his stick as we went along the way. Dinomite was disappointed in the lack of animal life we did see. Perhaps next time we'll take a different trail. We did run into a toad, some snails, a grasshopper, lots of ducks and geese, beautiful dragonflies and even a few butterflies. Unfortunately these were not on Dinomite's list of animals he wanted to find. He has been dying to find a real snake. It didn't happen. Thankfully after the hike, the visitor's center provided the kiddos with some hands on fun. Outside the windows was a viewing deck. The marsh was filled with ducks and geese, even some herons. We started our new learning time theme today! This week we're learning all about our religion, specifically focusing on the history of our church. We belong to The Church of Jesus Christ of Latter-day Saints. Most of the activities are very specific in nature, however, seeing as members of The Church of Jesus Christ of Latter-day Saints made the trek across the plains and mountains to Utah, some of the materials can be used when studying the Oregon Trail and/or pioneers. These activities would also be great for Pioneer Day and/or General Conference. Enjoy! I must say the name of our church is quite a mouth full, especially for little ones. I figured placing all of the words in order and saying the name was a great start to helping them learn it themselves. Bulldozer really loved the last activity we did using Scrabble pieces. I happened to be putting some away, when I felt inspired to create a similar activity using phrases from the scriptures. I love how they turned out and plan to definitely make more of them in the future. Source: I created this printable, for both free worksheets, click HERE. The cards cover some basic vocabulary and concepts for the kiddos in regards to our religion. I would have loved to create more, however I was unable to find the images. Source: I created these cards. For your free printable, click HERE. One of Bulldozer's goals for the year is to be able to sequence events. He REALLY struggles with this, and so I keep putting the same type of activities on the shelves, in hopes that eventually he'll be able to get it. This week we're sequencing specific events that happened in Joseph Smith's life while in Palmyra, NY. I used pictures from our Gospel Art Kit, but knowing how popular they are, I'm sure they can be found in church magazines and probably some pass along cards. We worked on counting by 2's a while back, but it didn't really stick. This activity doesn't really have anything to do with pioneer history, but I thought it would be nice. We've also been singing a new song to help us practice counting by 2's. The kiddos, especially Dinomite and Princess, are starting to become interested in the hymn books at church. They're trying to find the hymns we're singing etc. At times they really struggle, so I thought it fun to have an activity where they learn and practice how to find the right numbers. This could be a great activity for multiple kids, as you could turn it into a race or contest etc. I'm excited they seem to be enjoying it so far. We're moving up in the world when it comes to addition facts! I'm super excited Dinomite is doing so well with them. Princess always chooses this type of activity, as she loves the process. Hopefully she'll start memorizing some soon. Source: The addition wheel for this activity can be found at Montessori for Everyone. No unit about our religion can go without the study of The Plan of Salvation. Thankfully it didn't take me too long to find a free printable, saving me lots of work! Source: I found the free printable of The Plan of Salvation at www.lds.org. I decided to teach the kiddos about pioneer history by dividing events by state. We didn't go into too much detail, although they did learn why the Saints had to move to so many different places. A long time ago, (what seems like a completely different life time,) a friend and I drove across the country, starting in New York, and made our way to CO, where I was going to school. We stopped at all of the church sites we could find along the way. It was a fabulous trip. Later I was able to drive to Utah and visit many of the sites there. For years I have had this scrapbook under my bed of post cards, pictures, pamphlets etc. This week I put a few things to use. I found it easier to use places rather than events, just because some of the events are quite dramatic and/or hard for little ears to hear about. However, when it came to Missouri, I didn't seem to have much in my scrapbook, so I did use one picture from our Gospel Art Kit. I have not been to California where the Saints settled there, so again I had to use a Gospel Art Kit picture. I chose not to mention Winter Quarters and other places along the trail, just because I worried it would be too much for the kiddos to handle. The instruction of the material went fabulously. The kiddos had lots of questions. We pulled out our U.S. map and talked about how little children walked along the way too, living in each of the different places. At the end of the week, we plan on visiting Palmyra, located only 45 minutes from our home. It's been a long time since the kiddos visited the sites there. I'm super excited about it. It's no secret that the Saints encountered many dangers along the trail to the Salt Lake Valley. I planned this activity with Dinomite in mind, focusing on the dangerous animals that threatened the Saints. The instruction went so well today as the kiddos came up with reasons why each animal might be dangerous. Of course the bison was the most difficult, until I explained their thunderous stampedes, and that the Saints really had to be careful to stay out of their way. It was an added bonus that Dinomite had most of the animal figures I could use. The only animal not pictured (because Dinomite didn't have the figure,) was a Copperhead snake. Snakes were a very big deal on the trail. Source: I created this activity using multiple sources and references. For your free printable, click HERE. We've used this activity before, during our Healthy Heart Unit a while back. I couldn't resist using them again. These cards were made before I was making free copies available to my readers. However, I was able to make a similar set this week, so that one is available to all for use. Bulldozer loves this activity! I like that it's flexible according to belief systems and allergies. Nuts are included in the "No" category for him. Source: I created this printable and one similar too it for your use. For your free printable, click HERE. Music: We're still working at learning our song of the month on the piano. It's going much slower than I had intended. I might need to rethink my plans for next month. On a brighter note, the kids love singing time at the beginning of learning time. Art: Over the weekend the kids decided to draw A LOT, along with painting a little. Since they're doing so well at that, I've decided to count that as their art time this week. I'm so impressed by how confident Dinomite has become in his ability to draw. It has taken forever for him to find enjoyment in it, but now I can hardly stop him. The detail is fabulous. Physical Education: We'll continue going to our friend's pool this week. Next week all of our extra curricular activities start. Dinomite participates in a bowling league and takes gymnastics. Bulldozer participates in a bowling league, takes private tennis lessons, and is also taking private swim lessons as a form of physical therapy and sensory integration. Princess is taking dance classes and possibly martial arts if I can get her into lessons. If not, she'll continue with gymnastics. The boys have a very difficult time applying new skills to every day life. This seems to be typical of kiddos with autism. An example is Dinomite's ability to tell time. He does fabulous with cards during learning time, yet he can't tell time at all when it comes to looking at any of the clocks in our home. The same goes for those practical life skills. He can button easily using a board, yet shirts are impossible. Not only can he not button, but he can't unbutton either. So, seeing as I know he will be wearing white button up shirts on Sundays for at least the next 12 years of his life, I've decided to just use his shirt for the activity. Lol. Hopefully we'll get somewhere! It's been so long since I made a sensory bin for the kiddos. This bin could be much more elaborate. I only used items we had in our home. It's the end of the month. Finances are tight. Sensory bins can be so expensive. This one didn't cost me a penny. The best part is all the kids have LOVED it! I would have loved to include a sewing activity on our shelves, however, the kiddos really struggle with the simple sewing cards. They just can't seem to get the coordination down. So, I decided to focus on buttons this week. A friend gave me an entire gallon size Ziploc bag full of buttons. I can't wait to use them all. This week we're starting the sorting process! Playing marbles was a very popular thing back in the day of pioneers. It's funny that it's one of Bulldozer's favorite things too. However, he's never really learned how to play. This week that changes. I didn't have a big enough string to make one large circle, so instead I tied two together. Dinomite played this game for quite some time today. They're not ready to play together yet, but they're working hard the develop the skills to do so on their own. Looking back, I can't imagine how many homes just one family built from the time they left Palmyra, NY to the time they arrived in the Salt Lake Valley. Most were made of logs. Other's eventually made of brick. The kiddos are loving the Lincoln Logs back on the shelves. These have been on our shelves before. I found the images in church magazines, glued them to large Popsicle sticks and voila! These puzzles in particular are pioneer themed. This is not necessarily a pioneer themed activity, but when I thought of the idea, I just couldn't resist. Inside the black play dough are 13 pearls. The kiddos will manipulate the play dough until they find all of the pearls. It is then their job to put them back in the dough and hide them for the next person. I hope you enjoy these activities. It's been a fun week so far. I'm so excited to teach the kiddos more about who they are and what they believe. Our history is so packed full of wonderful lessons and experiences. As I've taught them, I've realized that it leads into so many more meaningful discussions. It's been very relaxing (and entertaining). Next week we start a new month long unit: Life At Sea. I'm hoping before the start of next week to have a break down of all that we'll study posted up. Hopefully my readers can make more sense of why I'm choosing the activities I am each week. Our district required me to hand in a syllabus. Mine is broken down by month, I just haven't shared any of them yet. Thank you for all of your comments! I LOVE reading them. They truly make my day. You'll notice some repeats in this week's activities. Partly on purpose, because we're focusing on our country, but also because I just didn't get around to creating others. My husband started a new job last week. Sunshine started some new therapies. Some extra curricular activities have started up. Needless to say I'm exhausted. However, with that said, there are definitely a few new activities on the shelves that the kids have gone crazy over. Who would have thought? Here's what we've been doing! This is a repeat of last week. Only Princess touched it. I'm hoping it will get more use this time around. Source: I found this idea at Smart School House. This is a repeat from the beginning of July, during our 4th of July week. Source: I created these cards. They are part of a bigger printable. If you would like your free set, click HERE. My mom picked this up at a yard sale. We don't play it as a game, but it works perfect to practice our spelling in a different way! This activity is a repeat, but was actually requested by Dinomite as he's learned the "Nonagon" song we've been practicing and is very intrigued by these types of shapes right now. This is a repeat from earlier this month. The kiddos were doing well with it until Bulldozer had a really off day. He said he would never do the activity again. I'm hoping this week he'll try, forgetting about the past, as both he and Princess really need to understand what's being presented here. They can both identify all of their numbers through 99, but neither can count past 30. I was really hoping this would help them. This is a repeat from April, but worked perfectly with our unit this week. Source. I found these cards as part of a printable packet at Homeschool Creations. This is a repeat, but again was requested by the kiddos. They are LOVING learning about the 50 states. By the end of the year, I'm guessing they'll know them better than I do. These cards have been great this week. I was super excited to find them for free. Source: I found these free parts of a plant cards at Montessori Materials. This is one of the few new activities this week. I created it myself, and boy have the kiddos LOVED it. Dinomite couldn't wait for learning time on Monday, just to get his hands on this. Then when it was time to end learning time, he just couldn't. Such an animal lover that boy! We spent an entire month learning about mammals, reptiles, amphibians, birds, and fish way back in February. To check out those activities click on the names of the groups above. If you would like a printable I created for any of those units, e-mail me at renaemarienae@gmail.com with the title of the post and title of the activity. The kids learned about the five groups of animals and know them quite well. Yet we hadn't reviewed them since. This year, not only will we review each group, but also include mollusks, arachnids, crustaceans, insects, and echinoderms. This is our intro activity into those new groups and how they compare to the old. I admit, Dinomite's vast collection of animal figures came in quite handy. However, I couldn't find his squid, which I was disappointed about. Bulldozer and Princess will just work on matching animal figures to animal cards. Dinomite will group them accordingly. He did a fabulous job, knowing almost every single answer the first time through. I admit, I had to look some up and make sure to write the answers on the back. Source: I created this printable. For a free copy, click HERE. Missing from the picture are scissors and a magnifying glass. A dear friend just happened to bring me some beautiful flowers last week. As the petals have started to fall, I felt inspired to use them as part of our learning time this week, and boy am I glad I did. This was by far the most popular activity on the shelves on Monday. The kids had an absolute blast taking apart a flower to discover all it's insides. I placed a set of flower part cards in the tray so they could learn the names of what they were seeing. Each day I've used a different kind of flower, so they can see the variations in the size and design of parts. Source: I found the free flower part cards at The Helpful Garden. This is a new activity on our shelves this week. Each month this year we're focusing on a new composer. I wanted to introduce the kiddos to their names and faces, so I created these cards. Art: The kids have been working on drawing pictures of their family and house all week long. I'll post my favorites at the end of the week. Dinomite and Bulldozer have extreme sensitivities when it comes to foods. It's just part of the deal with their autism. Of course they can't like the same things, which always makes it interesting. Over the past couple of months the only hot dogs and chicken nuggets that Dinomite will eat have been discontinued. Now, I wouldn't mind this if he ate any other types of proteins, but the only other one he'll touch is peanut butter. When it comes to dairy he'll eat a little bit more of a variety, however, eating is a HUGE struggle for him everyday. I've noticed when I've had taste tests during learning time he tastes without hesitation. This baffles me. After some thought, I decided to see if we might be able to widen his food repertoire through taste testing activities. He will eat vanilla yogurt, but no other kinds. He doesn't like seeds or chunks of fruit in it at all. Bulldozer is allergic to all berries. He won't eat any yogurt. I purchased six different kinds of yogurt, key lime, honey, Boston Cream Pie, peach, banana, and lemon and put out samples on a tray. Sure enough all three kiddos did some taste testing. Bulldozer only tasted the Boston Cream Pie yogurt, which he decided he didn't like, but I'm guessing he'll attempt more as the week progresses. Dinomite has decided he likes banana and lemon yogurts. I know this may not sound like a big deal to some, but for us, on the brink of needing to push Dinomite into food therapy, this is huge! I wonder what I'll try out next week? We haven't been cutting at all lately. I noticed Bulldozer was getting quite sloppy, using two hands to work the scissors again, so I made a shapes sheet for the kids to practice their cutting skills. The kiddos love flashlights. I figured this would be a fun practical life activity for them. I was right! Who knows if they'll actually touch this activity, because they really have no desire to do this type of thing, but maybe by the end of the week they will. They're pros at stringing large beads, so I figured we'd use the small this time. I keep forgetting to mention that we've been adding the iPad to our shelves, using different apps specifically designed for kiddos with autism each week. When I get up the ambition and have time, I'll be sure to make a list of the apps we've used so far and enjoy. 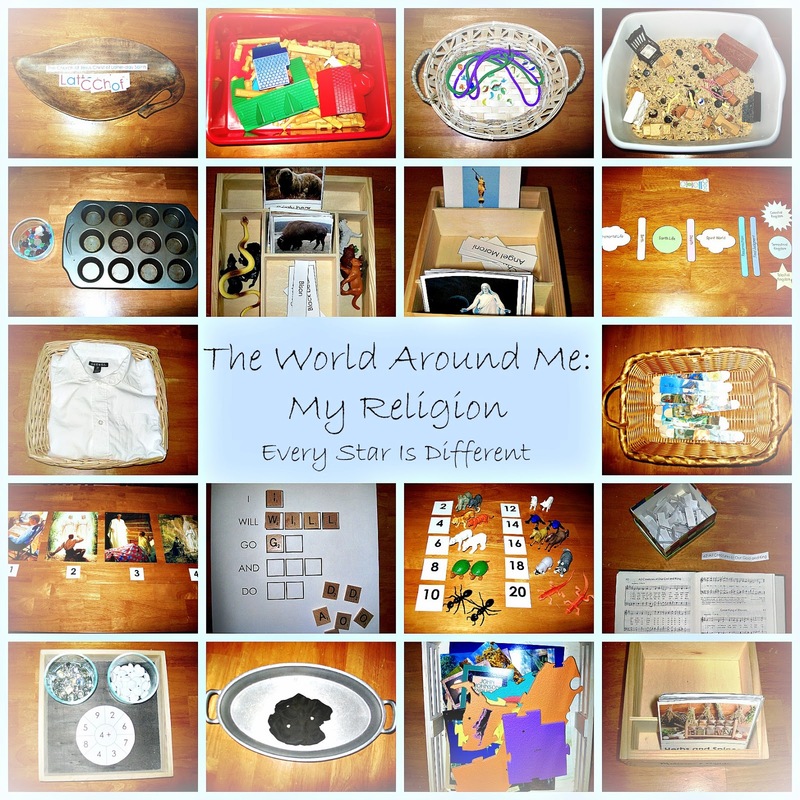 Next week our activities will be focusing around the theme of our religion. Since we are members of the church of Jesus Christ of Latter-day Saints, many of the activities will have to do with the history of our church. I'm super excited about this, as I have a trip to Palmyra, NY planned. We only live 45 minutes away. Its' been a long time since the kiddos have been there! Hopefully the weather and budget will cooperate! Bulldozer has been really struggling during learning time, needing one-to-one assistance 99% of the time, until we come to Friday, when he's discovered the four easiest activities on the shelves and has done them once already. This process has been extremely frustrating for both of us. I reflected on what activities seem to work for Bulldozer and worked hard to incorporate those this week. Today was our second day of learning day, our first day of independent shelf work. He completed almost all four tasks without help. I was so proud of him. I need to remember he struggles with any activities that have more than one step involved. What a fabulous week for him this has been so far! There are some activities with no picture. I chose to keep the identities of my kiddos private. Permission by extended family members has been given to show their pictures in this post. I was thrilled to find this idea while searching for a fun way to have the kiddos review their upper and lowercase letter recognition this week. Granted, the activity from my source looks much prettier than mine. Instead of gluing letters on sticks etc., I just used marker. Since I used the same color marker for both sets of letters, I added a dot to teach stick, blue for uppercase and green for lowercase letters. This way the kiddos won't get confused. This was the first activity Princess chose this week. She did fabulous with it! Taking advantage of our new movable alphabet, I created an activity using our family members to go along with our theme for the week. We don't have uppercase letters, but the kiddos don't know about that yet. I'm hoping each kiddo will practice spelling out the names of each of the members of our family. Source: I created the cards for this activity, including the movable alphabet. If you would like your own free printable of the movable alphabet, click HERE. We've used these before, but I've never required the kiddos to actually write in the letters. I think they're finally ready! We'll see! Source: These cards are available for free at Montessori Print Shop. I just loved this activity when I saw it. What a great way to review coin values. There are so many options available within the printable. Bulldozer did fabulous with it today. Source: I found free printable for this activity at Counting Coconuts. I used flashcards we have at home as control cards. One of Bulldozer's goals for the year is to be able to sequence. He really struggles in this area. Seeing as how last week's activity went so well, I decided to do something similar. This time the kiddos will sequence the pictures of our immediate family members from oldest to youngest. Source: I created all of the cards for this activity. Princess absolutely loves this activity. Nine out of ten times, when she feels up to it, she answers them all correctly. Such a smart little girl! Source: I found the free printable for this activity at Montessori for Everyone. My mother found these at a yard sale and knew we'd have fun using them. Princess loves puzzles, so this was a hands down winner with her. I'm really hoping the other two will enjoy it too! Source: My mother's yard sale excursion. This activity was designed specifically with Bulldozer in mind. He loves these sorting activities, and goes nuts over any type of storm right now (hence all the types of storms in the pictures). I love how the printable turned out as all of the items are those in nature. Bulldozer loved the activity and completed it all on his own. Source: I created this printable. For your free printable, click HERE. I find it so comical that any time I have taste testing on our shelves, Dinomite goes straight for it, yet getting him to eat anything at the table is impossible. This week we tasted sugar-sweet, salt-salty, cocoa-bitter, and lemon juice-sour. So far it's been a huge hit. Source: My apologies for not writing down where I found this activity. If anyone has a source, please write it in a comment. Thank you! We've done this activity before, but it's been a while. Dinomite has really enjoyed learning and understanding how everyone is related, especially Mommy's and Daddy's brothers and sisters. I drew a family tree on a piece of cardstock, with lines connecting family members. The kiddos will place family member pictures where they belong on the tree. Source: I created this activity. The basket for this activity holds several objects, representing interests and passions of those in our home. To make it fair, I chose three objects for each person. Daddy likes baseball, basketball, and Superheroes. Mommy likes music, traveling (puzzle piece of Europe), and flowers. Dinomite likes sea monsters, snakes, and LEGOS. Bulldozer likes monster trucks, cows, and LEGO DUPLOS. Princess likes My Little Pony, Disney Princesses, and puzzles. Sunshine likes babies, doggies, and kitties. 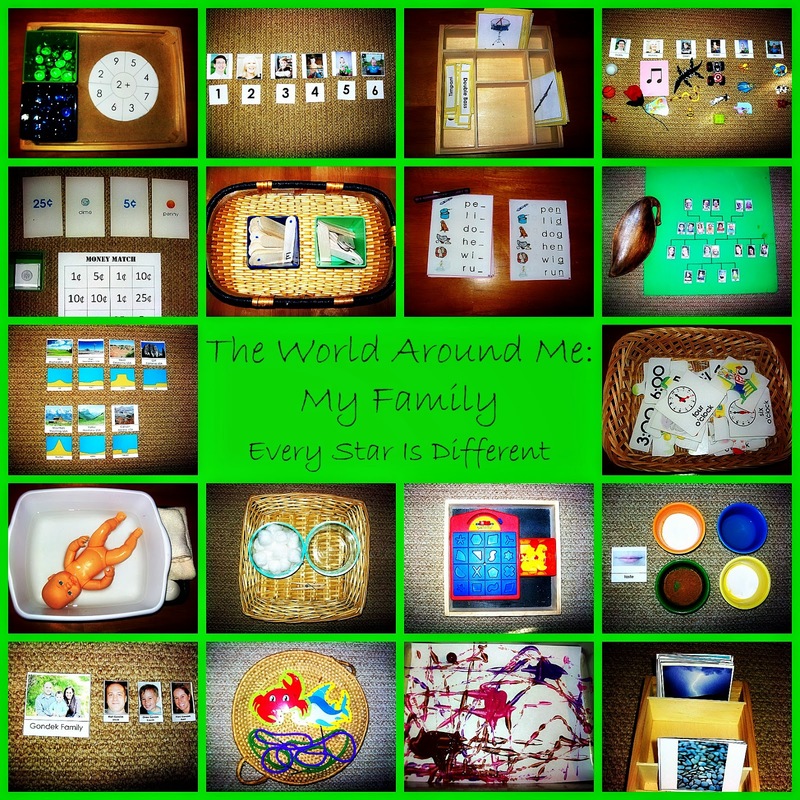 The kiddos will sort the items in the basket, placing them underneath a picture of each family member. The closest family we have live over an hour away. Needless to say, we don't see extended family often. When we do, the kiddos get very confused about who belongs to who. I created this activity to help them sort it out. In the basket are labeled pictures of their four aunts' and one uncle's families. In the cup beside it are individual pictures of aunts, uncles, and cousins. The kiddos will match up the individual pictures to the family pictures. My sister gave me permission to use her family photo as my activity example. I'm hoping this activity will not only help them learn who's with who, but also help them become more familiar with names. Source: I created cards for this activity. We've done land forms in the past, using the clay models, with pouring water etc. I wanted to do something different this time, mostly because I didn't have any clay on hand, and didn't want to clean up the mess. Not to mention, the kiddos didn't really understand the concept of what they were doing. All they knew was that they were able to practice pouring water. This time, I created landscape picture cards they're able to match up to the land form drawings. I know for me, this helped tremendously in learning the differences between each land form. It's been a hit with them as well. All of the photographs I've used are land forms in the United States of America. They thought this was really neat. Source: I found these free land form cards at Montessori Mom. I created the landscape picture cards. For your free printable, click HERE. This activity is nothing new. It's pretty much everywhere. Still the kiddos love it and I wanted something fun for them to enjoy this week. It's been a while since I've brought out this activity. The kiddos will match instruments to names, but also group them by type. Dinomite does very well with this! Source: I created these cards, for your free copy. click HERE. None of the kiddos can bathe themselves yet. Dinomite wants to try a shower. I've told him he can't until he can wash himself by himself. I desperately wanted to make step by step sequence cards for him to go along with this activity, but couldn't find any pictures I really liked, and then forgot to take pictures of his body parts. Still the activity has gone well. I'm using a bar of soap specifically because all three kiddos have an extremely hard time keeping it in their hands. Practice makes perfect right? This is quite simple, but to my surprise was the first activity Bulldozer pulled off the shelves this week. He really enjoyed it. The kiddos use a clothespin to transfer individual cotton balls to the other bowl. These are not a favorite in our house, however, it's still a skill that needs to be learned. Dinomite tried today, only because he had done all of the other activities on the "fun shelves: and there was still time left. The kiddos love this game. They don't use the timer until after they've put all of their pieces in. Then they love to watch them all pop out. It's super cute. So far we're having a fabulous week! 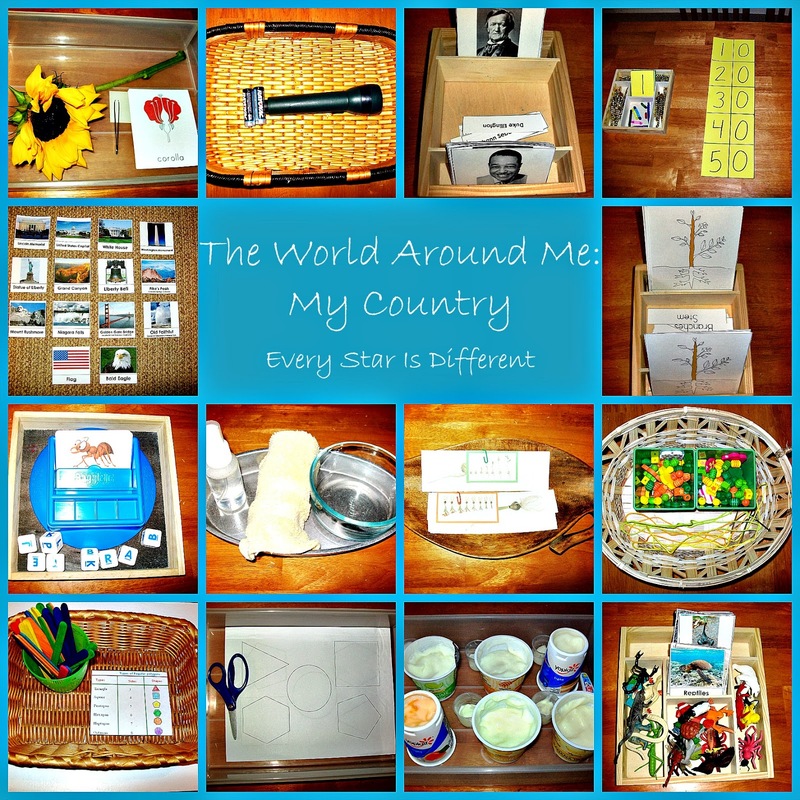 Next week's focus of the world around me will be our country.